Has Olmert Flipped or Flopped? Apparently, Olmert is feeling the pressure from Barak who is making easy-to-make announcements to show how much of a security hawk he is (not to mention that elections are around the corner). So suddenly, Olmert is now telling Rice that building will continue in Jerusalem and the major settlement blocks, as under any agreement he forges, they will remain under Israeli sovereignty anyway. Meanwhile, while there is some “new” construction going on, nothing seriously seems to have changed on the ground as many people and companies still await building permits they should have gotten years ago. Of course, as he makes that statement, police are currently trying to destroy a foundation for caravans in a Settlement. I guess that makes him look busy. 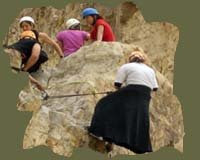 Tired of the standard tours, the same sites, or simply looking for something exciting and different to do over Pesach? 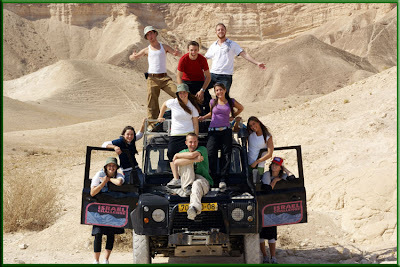 They have packages for individuals, groups, half-day tours, overnights - Israel Challenge gives you a different experience of Israel. I have been dying to use that title for something. Seriously, how often does a serious (and positive) event happen, that you can satirically tack a title like that onto it? Well, a well known Rabbi, Rabbi Shalom Rosner of Congregation Bais Ephraim Yitzchak of Woodmere, NY just announced to his congregation that he is moving to Israel, forging a new community, and that a number of his congregants are joining him. The truth is, I doubt Rabbi Rosner's congregants were that surprised. His wife (a doctor) gave a major interview about how Nefesh b’Nefesh is helping her with their Aliyah plans. And obviously Rabbi Rosner has been talking to amenable ears in his congregation who will be following him. Of course, most people talk for years about Aliyah, before they actually do it. Anyway, Rabbi Rosner is moving to a new neighborhood in Beit Shemesh called Nofei HaShemesh, where he will be taking a lead role in building the community (of 400 homes), schools, shuls, and so on. Back before Yom Kippur, I posted about the Gaza Refugees and the Settlement of Maskiot. They were looking for money for a shul so they could daven together on Yom Kippur. Maskiot made the JP news today as we learned that the government can't make, much less keep any decision (or promise) it makes. After fully and legally permitting 30 Gaza Refugees to move to and live in Maskiot (yes, that's right the government still hasn't relocated most of the refugees to permanent residences), the other hand of the government turned around and decided that yes they can live there, and yes they can make it their residence, and yes ,it is all legal - but they aren't allowed to build their homes, or even put down a caravan. Screwed up is what it is. Yup, it's reeducation time in Israel. Yekutiel Ben-Yaakov of Kfar Tapuach was convicted of "incitement to racism"
In the months leading up to the Expulsion of the Jews, Ben-Yaakov ran a private referendum. Do you prefer more of the "Sharon/Peres Disengagement Plan" which includes transfering more Jewish towns in Judea and Samaria to "Palestinian" control, and expulsion of the Jews who live there - A move that would bring "Palestinian" territory closer to major Israeli cities such as Tel Aviv, Kfar Saba and Jerusalem. "The Jewish Alternative Disengagement Plan" which includes annexing these territories and expulsion of hostile Arabs living there (those who refuse to commit not to harm Jews) to an area outside of Israel, deep beyond a safe security buffer zone - A move that would effectivelly distance the "Palestinian" population from major Israeli cities like Tel Aviv and Jerusalem. Apparently demanding the expulsion "hostile Arabs" is incitement. Who knew? Send me to a course. After reading statements and articles about two of the primary candidates for US president, it is honestly not clear to me that either one is going to be particularly good for the Jews (of Israel). Both have ill-advisedly surrounded themselves with advisors who (to state it gently) do not have a very pro-Israel position/history. Past statements from Obama seems to have a Palestinian tilt, while McCain has shown himself to be completely ignorant on the most current and publicized flare-ups in the latest US-Israel crisis, which leads him to be overly susceptable to influence by his policy advisors. On the flip side, Rice certainly joined the dark side and is dragging Bush down that road with her. It’s unfortunately become a theme on this blog to point out that the system and the government have completely abandoned the security of the people. The truth is, it’s not so much a theme on this blog, but a statement of fact that deserves constant repetition as a wakeup call. And wakeup, yet another person finally has. As the latest Intifada incarnation spreads across Israel, the police are afraid to act against the Arab aggressors who take advantage of the weakened state of the State. Caroline Glick has an amazing article about an anonymous young man, who, tired of the poaching of his father’s fields and property in the Galilee by a neighboring Arab clan, as well as the complete inaction and apathy of the police, decided to do something about it personally. During his army furlough, he started to camp out in the fields to keep the thieves away. Unable to do it all alone, he enlisted the help of other children of neighboring farmers, also all soldiers, to join him. And so they did. And while the police had given up even before getting started, these young men put an end to the thieving all by themselves. He decided to call his group of friends, “Hashomer Hayisraeli Hahadash” – the New Israeli Guardsmen, named after the original “Guardsmen” organization that helped protect farmers against Arab marauders in the early 1900s. Is the dollar on a rebound in Israel? I hope all the importers took advantage of it while it lasted (and it's reflected in end-consumer prices). Half-shekel found just in time. 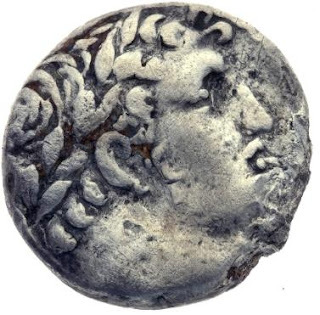 Arutz-7 has an interesting article on a Second Temple period half shekel coin being found (see pictures below). Traditionally the half-shekel was given during the month of Adar (that is when we are right now). 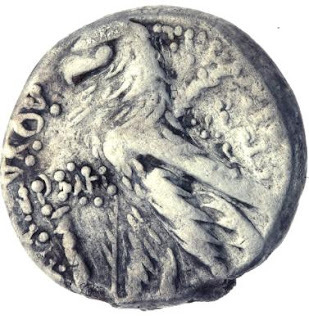 Personally I think it is a bit strange that they used a coin with an Avodah Zarah image on it. 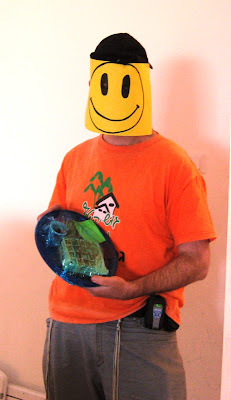 I really, really want to write a Purim Post. I just can't think of anything funny yet. Evelyn Gordon has a very good article in the JP today. She compares PA rhetoric with the facts on the ground. Why did Sadat make Peace? Besides the money, I heard an interesting explanation recently as to why Sadat made peace with Israel. Apparently he was scared of his upgraded satellite status in the Soviet empire (and its lack of long term benefits) and other related reasons I can't remember anymore, and this was his out. As you probably heard, a rabbi from Ateret Cohanim, Rabbi Yechezkel Greenwald, father of four was stabbed today outside Sha'ar Shchem in the Old City. His murder was prevented by a student accompanying him who fought off the attacker. Besides the attack on Mercaz Harav, there was apparently an attempt to commit a similar act at yeshiva Porat Yosef in the Old City, and we all remember the failed attack on the Yeshiva in Kfar Etzion. Apparently the Arabs have changed tactics. They understand (more than the Left it seems) that the strength of the Jews (in Israel and out) derives directly from our students and teachers who learn and teach Torah - so they have decided to try to destroy what really makes us strong. If you want to comment, no more anonymous comments. You can post using the anonymous sign-in (I know, it's easiest), but you have to add some sort of unique call-sign/signature to your post so you can be identified and distinguished from the previous anonymous commenter. Why is the Jewish reaction to violence against us so subdued? From the Holocaust to Oslo to Gush Katif to Peki’in to Mercaz Harav, the Jewish people, with certain exceptions, tend to take an exceptionally passive response to violence against us, until pushed into a corner. Honestly, even the wars Israel has been in, Israel usually fought them only because we had no choice. Jews don’t seem to get excited. Jews don’t seem to react to violence with action. Look through the stories in Tanach. Again with certain notable exceptions (Shimon, Levy, King David, the Judges), the people tend to be extremely passive, until some real leader comes along and drives us forward, or until a situation becomes so unbearable that the alternative to no response is destruction. I’m not saying if this is a good thing or a bad thing, it just seems to be the way we are. Let’s look at the reaction to the murder of the Yeshiva boys. Until yesterday, no one reacted. The tent wasn’t ripped down. There were no riots. No counterattacks. Public calls for violent revenge came literally from the fringe, in fact, when the Left went looking for extremism (“extremism”?, more like any reaction whatsoever) they couldn’t find any, so instead they made up some stories. Finally, yesterday around a hundred people went into the Arab neighborhood and threw stones (and had stones thrown back at them). They commented that they were surprised at how violent and angry the Jews were. They weren’t expecting so strong a reaction. In fact, they weren’t really expecting any violence at all - from the Jewish side. Perhaps this passivity, thinking (and thinking some more) before acting (if at all), not rocking the boat has helped us survive many situations since Abraham. On the other hand, could it be that we’ve taken it too far, and by not responding properly, or at all (or leaving it into the hands of others who also react in a limited fashion) it is now working to our detriment? I don’t know, and I’d like to hear what you think. We must be getting closer to elections. The attacks on Netanyahu are heating up. There's no prize here for the dropping dollar. That's for sure. It's gone below 3.5 and it's not clear that the Bank of Israel's surprise intervention will have any long-term effect. From where I sit, this isn't good. There’s no doubt that experience counts for a lot. Before you actually have to deal with a dangerous or frightening situation (and never having dealt with it before) you can never be sure how you are going to react. I remember the first time I had to lead a team into a terrorist’s hideout. Until I did it, I didn’t know if I would be able to. Two, possibly three police officers were on the scene at Mercaz Harav at the start of the attack, and they didn’t go in to storm the building and kill the terrorist. Most likely they didn’t have training for dealing with these kinds of situations. But worse, it simply wasn’t engrained into them that protecting the public is what they signed up for. The system failed to train them properly. When police (and the army) are forced to take part in, and train for political assignments, as opposed to their core duties there is no reason to assume they won’t fail when it actually comes to fulfilling the job they are supposed to be doing. Defending the average citizen. Olmert’s latest hudna with Hamas failed, just like his (first and) second war against terrorism. The first time he was untried and inexperienced and couldn’t know how he would react, but by this time he should have learned from experience, but he obviously hasn’t. Most likely because, just like the police, he doesn’t understand and isn’t prepared to deal the with the core mission he was assigned. So instead he goes and directs traffic while avoiding his responsibility. I was in Ashkelon Tuesday night. When I got to the wedding hall, I asked the guards where their security room was in case a Katyusha fell. They said there wasn’t one, nor was a Katyusha going to fall. Needless to say, a Katyusha fell on Ashkelon (no where near us though). On the other hand, senior terrorists were finally eliminated as they hung out in a Bethlehem restaurant the other day. At least some people know their jobs and are capable of pulling it off. I guess it comes down to some people are simply unable to learn and change, no matter how many times they repeatedly face the same situation. A settler acquaintance of mine just got his Milluim orders. He'll be in Hebron for Purim. Did I mention he's a doctor. A pediatrician in fact. In today’s surreal news of the day, Moshe Feiglin has been banned from visiting England. Moshe’s response so far is that he had no short or long-term plans to visit there anyway. I think we need to help Moshe formulate a more official public response. 2. Menachem Begin and Me. 3. Shakespeare may not have been an anti-Semite, but I know who is. 5. This is a wakeup call to British Jewry that the UK is no longer the place for you to be. Leave it to the growing British family of Islamic fundamentalists. 7. You banned Feiglin and not JoeSettler! 9. If Hizbollah terrorists are allowed to visit and live there, why would I want to go to England. It is unfortunately not coincidental that what I was doing yesterday evening was directly related to the massacre at the Mercaz Harav high school. 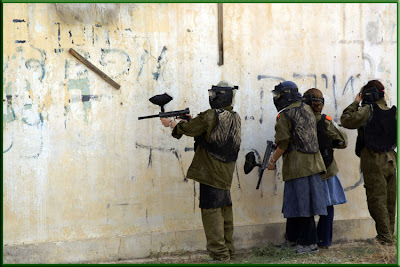 Two weeks ago, terrorists attempted to commit a massacre at a high school in Gush Etzion. Those terrorists were killed by people at the school who had undergone training for these situations. Over the past few weeks there have been roadside bombs in Gush Etzion. Major stonings, and firebombs at passing Jewish cars. Shootings. Murders. Infiltrations into Settlements. This past week we saw the attempted lynch by the Arabs in Jerusalem, the attacks on soldiers and police officers in Jerusalem, and the general escalation. Last night, before the massacre, we were training in one of the local schools. Specifically, we were working on the various techniques, protocols, and procedures for handling different situations where a terrorist has entered a school. As we trained, we laughed and joked. Yes, its serious training, but you can’t hang around for hours with a bunch of armed (unloaded) guys (most of us with serious combat training and experience) and not joke around. Some local high school kids were invited to participate with us for the color. When it was my turn to play the terrorist, I grabbed one high-schoolers and used him as a human shield while I mowed down the first rescue squad - until they figured out how to effectively neutralize me. But then it came in, we got notice over our radios that there was a major attack on the Mercaz Harav Yeshiva in Jerusalem. Maybe dozens dead and injured. The attack and shooting was still going on as we listened to one side of the report. Our training session ended immediately. We quickly did a summation while the security chiefs checked to see how things were on our own perimeters. We went home to listen to the news. An hour after we got home, we got a full-scale, emergency drill call-up. It was decided that we needed to finish the entire session that was planned for the evening. In that session (as we were to find out), a group of terrorist had entered a high school dormitory and were shooting away – a scenario far too similar to that evenings events. A scenario that is expected. We all drove/ran to get there. Students and dorm counselors from the school lay “dead” and “injured” on the floor as we began combing the building for the terrorists. One terrorist had been killed at the beginning by a dorm counselor. We quickly engaged the others and “killed” them (of course “confirming our kill”). For obvious reasons I’m not going to go into details, but the students all undergo drills on how to act and respond to a terrorist infiltration. Unlike the earlier training session, this drill had the taste of reality lingering over it. This time there was no joking, no humor. Just pure professionalism as we quickly took the building and “saved” these high school kids from the Arab terrorists. People like to say think that this stuff only happens in the Yishuvim (settlements) which is why we need to train like that all the time, and perhaps as an excuse to say we don't belong in this part of Eretz Yisrael. But last night’s massacre occurred in Jerusalem. The terrorist was the school’s bus driver. The guy who took these kids to and from school. The guy who was making a decent living from the Yeshiva. The guy who saw these kids every day. The good Arab, who isn’t like “them”, the ones who want to kill Jews. He was someone they trusted. (The police and Yeshiva are now saying that this is not correct). And this guy was prepared. He was well armed. He was obviously trained well enough to use his weapons and multiple magazines effectively. This was an operation that was thought out and organized. It is not coincidental that we do these training sessions and drills regularly, and why they should be expanded to other schools around the country. The Arabs have no compunctions about going into schools, be they nursery schools or high-schools, and killing all the little children they can find. And that’s not coincidental either. Today was Yom Kippur Kattan. 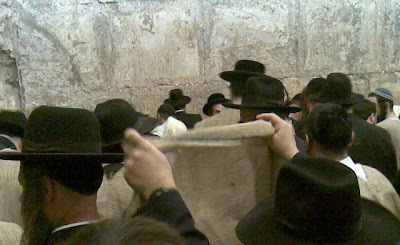 I was at the kotel today when down came tens of Chareidi men wearing sackcloth. I asked and was told, they are specifically praying for our cities in the South that are under attack. 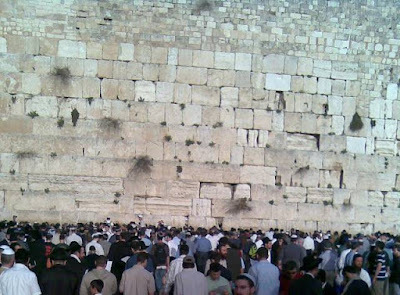 All in all, thousands of people showed up to at the Kotel for this special prayer session. 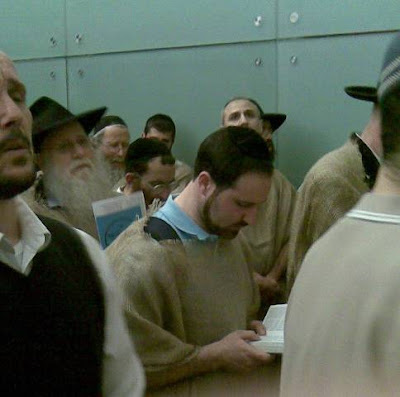 As I am writing this, there is a terrorist attack going on in the Mercaz Harav Yeshiva in Jerusalem. Details are unclear. Possibly 10 8 people killed and dozens 30 wounded. Possible bomb belt used. When will this country defend itself? If you're going to shoot, shoot. Don't talk. I've raised this idea in the past. A facebook group was started for this express purpose. 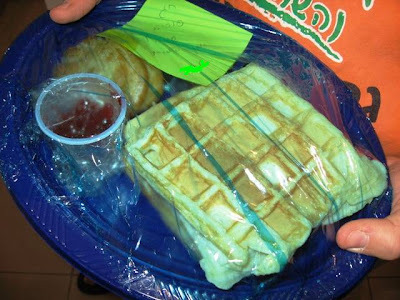 Now it seems an Ashkelon man has taken the first step. Moshe Nissimpor of Ashkelon has decided that he has had enough. He built his own 200mm missile in his backyard and threatened to launch it into Gaza. 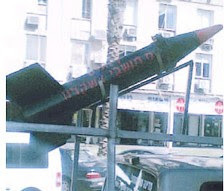 Unfortunately his next step was to take it to the Ashkelon Municipality building to show it off, rather than to launch it. Police seized the missile. Personally I'm not convinced it was real. Caught this on Boker Tov, Boulder who found it on Elder of Ziyon. What I found most amusing in this attempted lynching video was the well dressed Arab man in the cardigan and neck-tie who thought he made sure no one was looking when he participated in attacking the car. Anyway, most of you already know that the war has expanded to Jerusalem, so this isn't actually a surprise. On behalf of the 2,500 Warm the Needy families, I thank you for your generous and invaluable support. As you may know, this winter has been the coldest Israel has seen in thirty years. Twice, Jerusalem was blanketed with snow. A record number of cold-related deaths were reported. This made our efforts ever so important. Thanks in significant part to you, Warm the Needy was able to distribute over six hundred heaters this winter as well as assist over 1,500 families with their electric bills. We could not have possibly done so without your help. As a grassroots organization, we do everything we can to ensure that 100% of every dollar is spent solely on actual aid work. There are no paid employees but a team of dedicated volunteers who work day and night for the cause. In partnership with the Israel Electric Corp., we have developed and maintain a sophisticated system spanning the entire country. We continue to work hand in hand with several major aid organizations across Israel battling the severe poverty now affecting over 1,678,000 Israeli classified as living below the poverty line. Our activists are spread throughout the country and ensure every family is dealt with professionally and in a self-respecting manner. With the winter coming to a close we look back at what we have achieved. Simply stated, through your assistance, we did a tremendous amount. 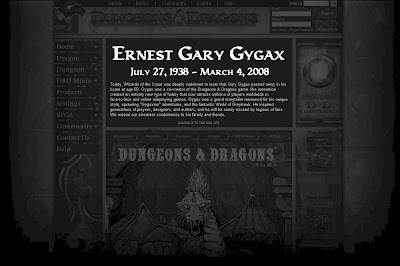 I wanted to personally thank you all for for your contributions, for your assistance, for your connections, for your kind remarks, and even for just taking an interest. I guess we know the name of the war now, "The One Day War". Pundits say that the war is on a break because Rice just came to visit. I think Olmert just got his wish granted and his chestnuts pulled out of the fire. Of course Hamas is still shooting on Israel. No one expects them to stop for Rice or incompetence. Ha'aretz is reporting that some Jewish UK students are boycotting a standardized test over the inclusion of Shakespeare, whom they claim was an anti-Semite. Someone slap these kids upside the head. Please. First of all, there is a good chance that Shakespeare never even met a Jew, as Jews weren’t allowed to live in England while Shakespeare was alive (unless you count those that claim the British Royal Family are descendents of King David – God Forbid). Second, as I read the Merchant of Venice I see a completely different picture. I see the way the goyim used to treat the Jews, and how one Jew, finding himself being cheated, goes to extreme measures and stands up for himself and for what is right, and ultimately finds himself suffering from the anti-Semitism that was prevalent in the time and place of the culture portrayed. If the following isn’t the best portrayal of a demand for human, equal and fair treatment for Jews, then I don’t know what is. I am a Jew. Hath not a Jew eyes? hath not a Jew hands, organs, dimensions, senses, affections, passions? fed with the same food, hurt with the same weapons, subject to the same diseases, healed by the same means, warmed and cooled by the same winter and summer, as a Christian is? Are these the words of an anti-Semite? As part of the escalation in Judea & Samaria, Arabs planted an explosive shell inside an old tire near the Beit El fence. Some Beit El children found the bomb, picked it up and took it to the moked. It was a miracle it didn't kill the little children who found it and innocently picked it up. What is this war going to be called (once the government gets around to calling it a war, that is)? I’m putting my money on the Jerusalem War, because I firmly believe that this is what it will escalate into. There have been attacks going on in the Gush Etzion region. Last night there was an attack on Gilo. Today an attack on soldiers near French Hill. The action is going to start in Gaza, escalate up North with Hezbollah, but finally explode in Jerusalem. Independent French balistic expert Jean-Claude Schlinger concluded that there is no way that the IDF could have shot al-Dura as they were only in a position to be shot at from the Palestinian side. Nor from the video he was shown is there any indication that boy and father were in reality shot at all at that time. Balistics Expert Schlinger concluded that the film was staged. I wrote a few weeks ago about the meeting between some Hebron Arab Clan Elders and Settler leaders. Now let me give the background behind that event (as told by Boaz HaEtzni). As many of you know, sicko Israeli leftists and anarchists are the instigators behind many (if not most) of the anti-Settler activities such as farm destructions, ripping down security fences, trespassing on settler land, and fake Arab-owned tree destructions, using the Arabs as willing dupes and fronts for their attacks. Regular readers of this blog know all the various attacks I’m talking about (particularly those caught on video camera). It turns out our sick Israeli leftists had another brilliant inspiration. 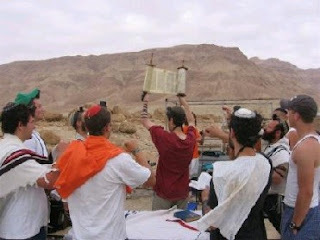 Last summer, they decided that on the upcoming Rosh Hashana night, they were going to go to Kiryat Arba, by way of the land of the Jabri clan and destroy the Chazon David Shul with a bulldozer, and “occupy” the land in protest. They went to Jabri clan heads with this latest plan, expecting the usual cooperation. But the tribe's leaders understood what this meant. This idea wasn’t about getting them free video cameras, money for recently pruned trees, or simple vandalism against their neighbors. An act like this would lead to an all-out religious war. An act like this would lead to a reaction by the Kiryat Arba/Hebron settlers that could literally mean the end of the Jabri clan. The clan was getting tired of the extra friction the anarchists were causing them with all their shenanigans, and finally understood where the leftists were leading them. Quite bravely, the clan leaders decided to step back from the brink. Since then, the clan heads began talking with the Settler heads culminating in the meeting 2 weeks ago when the settler leaders bestowed the clan heads with a thank you plaque for helping prevent the destruction of the synagogue by the sicko Israeli left.